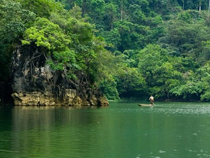 Ba Be Lake and its surrounding area are a limestone paradise.Lakes, waterfalls, caves and unusual rock formations are plentiful, and it is listed as one of Vietnam’s geological centers and biodiversity reservoirs. 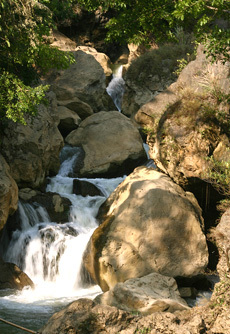 The whole area is richly forested and is home to many ethnic minority communities like the Tay, Nung, Dzao, andH’mong. This combination of a perfectly vibrant eco-system and fascinating local culture makes Ba Be an ideal destination for nature lovers and culture travelers. A boat trip to visit Puang Cave, visits to beautiful waterfalls, overnight stays at local houses, all this and more make a trek through Ba Be a memorable experience. Ba Be is with no doubt the best adventure tour to get away from the crowd. Get ready to explore the least visited yet most spectacular area in Northeast Vietnam! Embark a boat to cruise overBa Be Lake, enjoying the surrounding sceneries as well as dropping by local ethnic villages to meet the hospitable people. Experience nights at the home of local people, try their local food and discover their traditional values. Immerse yourself into the peaceful and natural beauty ofBa Be Lake and its surrounding area with its magnificent mountains, terraced rice fields and splendid waterfalls. You morning starts with a boat trip on Ba Be Lake to enjoy its serene and magical atmosphere. Follow Nang River to reach Puong Cave, home to thousands of bats. 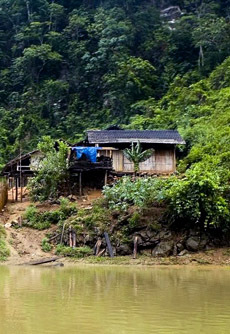 The boat will then take you to Ban Tau village, inhabited by Tay ethnic people known for their plain indigo costume. Picnic lunch in the village. In the afternoon, with horses carrying your luggage, you and your local guide begin your two-hour trek down a slope to reach a large village inhabited by Dzao ethnic people. 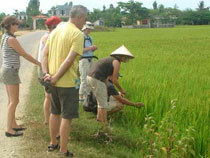 Take the chance to discover the traditions and customs of the Dao, who are very friendly and open. You will have the possibility to visit a local primary school on the way. Overnight at thehomestay of a Dao family. Share your meal and joy with them. (A small note: In summer, the guide may decide to commence the trek a bit later, than 2:00pm as it isextremely hot during the day). Free time to stroll around before returning to your vehicle for the transfer back to Hanoi. Several stops along the way. Return to your hotel. Asiatica Travel’s services end here. 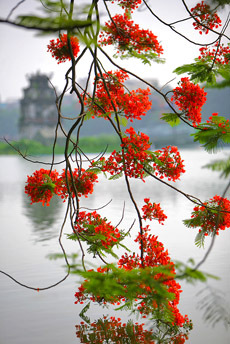 Located in Bac Can province, Ba Be Lake is the largest and perhaps the most beautiful natural lake in Vietnam.